Each chapter welcomes the reader with gorgeous official artwork. When it comes to the history of official Zelda guides, Nintendo’s usual go-to has long been Prima Games, who have published walkthroughs on the majority of titles in the franchise over the years. This time, however, Nintendo decided to go with Piggyback for their latest release Breath of the Wild — a bold move when you consider Prima’s rich history of quality publications. With this latest installment arguably considered the most ambitious Zelda title to date, such a guide needs a lot of care and attention. While Piggyback aren’t exactly strangers to working with Nintendo, their last (and only) Zelda guide book was well over a decade ago with their work on The Wind Waker. While it seems bizarre for Nintendo to place their largest and most complex Zelda game ever in less familiar hands, I am pleased to report that Piggyback has done a wonderful job on The Complete Official Guide. Reading through this book is enjoyable as much as it is helpful, and the Collector’s Edition has some enticing extras for fans of the beloved adventure series. Having been deeply involved with the Zelda community over the past five years and being a lifelong Zelda fan myself, I know as well as anyone that no one hates spoilers more than this fanbase. The problem with most video game walkthroughs is that, though we may need some guidance through a tricky section, we can be put off by the idea that we may accidentally see more of the game’s content than we’d like; plot details, upcoming boss fights, or locations that will no longer be a first-hand surprise during gameplay should we observe the wrong screenshot or paragraph. Some fans are more sensitive to spoilers than others, too. Some may happily consume any and all details of a Zelda game to engage in their excitement while others want to know nothing of the game in order to maintain a purity in their own first-hand experience. Thankfully, Piggyback recognises this problem and has designed its walkthroughs in such a way that they accommodate to all the varying levels of players’ preferences when it comes to spoiler exposure. The introduction to the main walkthrough advises players who want to finish the game with minimal assistance to stick to the map-oriented pages on their first playthrough. Each chapter of the main story walkthrough begins with these pages, which contain contain large maps of the area(s) required in each objective. The maps contain a highlighted path that players are recommended to follow, complete with numbered points along said path which highlight where tasks need completing or where story events will take place but without revealing what these focal points actually entail. 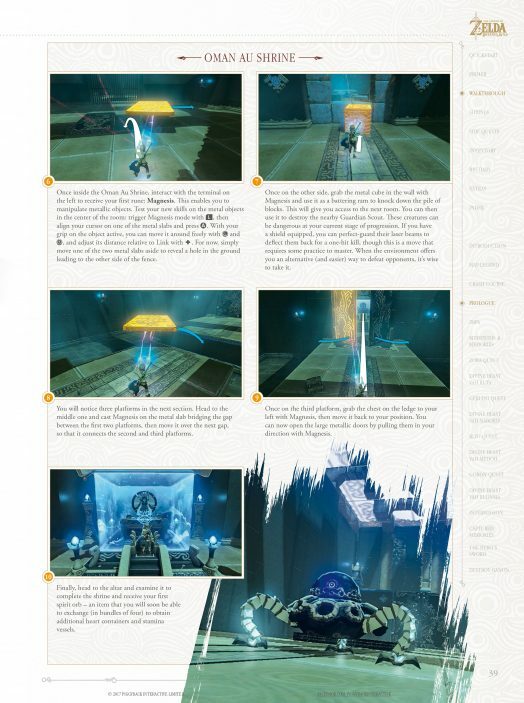 There are also markers indicating shrines and “optional objectives,” which include things like Korok Seed locations, enemy outposts and sub-bosses — again, remaining vague on what each objective actually is on the map itself. Piggyback describes these as “at-a-glance” walkthroughs, meaning if you’re lost and need just the slightest nudge in the right direction, you can quickly gain just the right amount of navigational insight you need from just a quick look at these maps. Of course, if you need a bit more guidance, there is text beside the maps that offers a summary of what to do at each story-based step or optional objective. But if you’re following the strictly minimal assistance route, these can be easily ignored. It’s very refreshing to see this approach as Zelda fans can finally receive the level of help required without the fear of encountering spoilers. It’s nice to finally read a guide comfortably without being on edge. 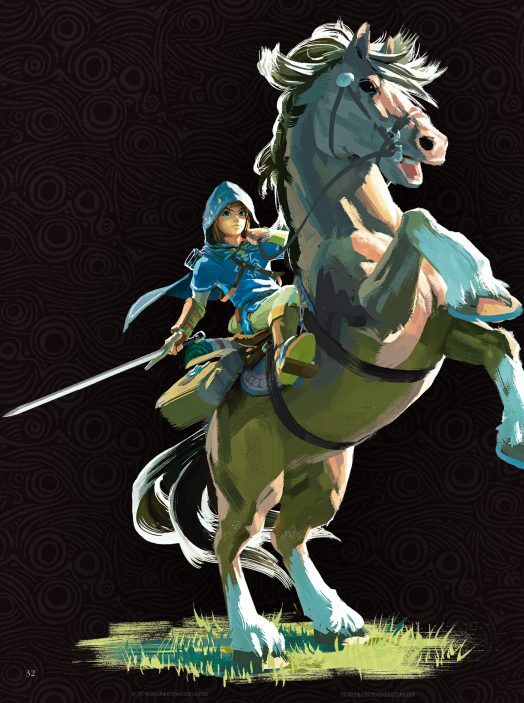 Zelda fans can finally receive the level of help required without the fear of encountering spoilers. If you’re absolutely fine with going further with the help you seek or are simply far too perplexed to progress on your own, there is of course a lot more depth to be found here. Turning the page past the aforementioned maps at the start of each chapter will bring you to the step-by-step walkthrough, leading you into the real meat of the guide. Each step contains an annotated screenshot, containing either an arrow in the direction Link need to go, or a circle illustrating a point of interest. If the map wasn’t quite enough for you but you still want to remain cautious on how much more information you consume, once again you can just use the screenshots alone as a quick visual indicator and ignore the text, allowing more room to ease yourself in rather than hastily absorbing every instruction. If you get as far as needing to read the text though, the written content is very accessible; it’s complex enough to describe exactly what you need to do without overwhelming the reader. Many of you may skip the main-story walkthroughs entirely and still find the guide infinitely helpful due to the sheer amount of optional content in Breath of the Wild. It’s the largest and most overwhelming world we’ve ever seen in the series, and the staggering amount of stuff to do and things to find means that, if you’re a completionist, it’s near impossible to play on your own accord without overlooking something. Sidequests, sub-bosses and location names aside, you have 120 shrines to overcome, 385 entries to fill in your Hyrule Compendium, and 900 Korok Seeds to locate. When you put it like that, Link would probably consider slaying Ganon and saving the world the easy part. Just a glance at the annotated screenshots can give you a nudge in the right direction; no need to completely spoil solutions until you need to! The same “at-a-glance” principle applies with all of these, so once again, it’s up to you how far you want to delve in for help. I found the “Inventory” chapter especially useful as there is no in-game list of recipes the player can follow to choose from the many different dishes and elixirs at Link’s disposal. Every time I found a cooking pot and decided it was time for an intense cooking session, I would make it a habit to open these pages of the book and find that it definitely enhanced my experience of the game. Having a list of things like this, as well as the required materials for armor upgrades and the sale prices of materials at hand, really saves a lot of time and hassle as you don’t need to hunt down the necessary vendors in the game or keep notes to access this information. With the inventory spaces so limited at the start of the game, this is invaluable in allowing you to plan ahead when deciding what items to hold onto. There are also some neat extras throughout the book, no matter what edition of the guide you go for. Breath of the Wild leaves the player entirely to their own devices, and the nature of the game means you are given no tutorials on how to approach each challenge. There is great appeal in discovering everything for yourself and learning from failure, but it does also mean that there are many secrets and techniques the player can miss completely. After my hours of playtime I was certain I had a strong grasp on how all of the game’s mechanics worked, but in fact I found myself frequently surprised as I kept discovering new tips on combat, mini-game strategies, and other secrets hiding in plain sight. One of the sections of the book I found most entertaining was one dedicated to the game’s Easter eggs — I had no idea there was such a vast number of locations which were direct references to past Zelda games. Did you know that “Nabi” is the Japanese spelling of Navi, making Nabi Lake a direct reference to Ocarina of Time? Let’s not forget the touching foreword written by Breath of the Wild producer Eiji Aonuma and director Hidemaro Fujibayashi. They briefly outline their ideals in their approach to a new Zelda game before and during development on the project as well as how they managed to achieve their many ambitions. I can’t think of a preface more welcoming than an introduction by these two talented gentlemen. What’s included in the Collector’s Edition? The first and most striking perk of the Collector’s Edition is the hardback cover. This thing is gorgeous, consisting simply of just official Breath of the Wild artwork with no text or logos cluttering and spoiling the view. Instead, the title of the book is placed modestly on the spine, where it shimmers in gold. The image of Link climbing a mountain while the sun sets over Hyrule behind him is already an iconic image in the hearts of Zelda fans, making it a great choice for this book. It’s a simple and almost minimalist approach that I wish more video game guides would take. There is also a satisfying glossy finish over Link and the mountain, so upon picking up the book I always take a second to feel the foreground with my fingertips and take in the view in the background, preparing me ever more for a great feeling of adventure as I boot up Breath of the Wild. Also included with the book is an extra-large, double-sided poster of the game’s map. 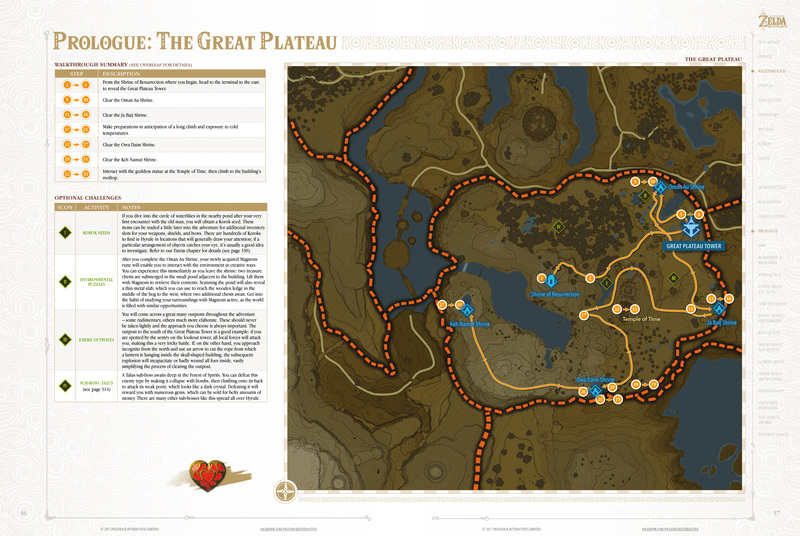 (This same map is also included in the regular edition of the guide, albeit smaller.) One side serves as a navigational aid with critical locations such as towers, shrines, villages and landmarks dotted across Hyrule. The opposite side aims to help those who strive to reach 100 percent completion, with all Korok Seed locations and location names marked clearly. You’re going to need a lot of space reserved on your walls if you want to pin up this map, but if you can find a good place for it, it makes for a nice decorative piece. I had fun laying the map out on the floor in front of me while I played Breath of the Wild, which not only served to help me but it also took me on a welcome nostalgic trip back to my childhood days, laying out my own hand-drawn maps while I played Zelda. Finally, the Collector’s Edition ends with a 16-page art section. This features concept art for all of the main cast of characters, as well as wildlife, enemies, and architecture you will encounter in the game. Many of this material is illustrated in such a way that it offers a small visual insight to the development process and reminds me of how the Skyward Sword concept art was presented in Hyrule Historia. Though brief, it’s a welcome addition and a pleasant bonus for fans. As someone who prefers to play games without help and in an age where countless walkthroughs are available for free online, I generally find it difficult to recommend official guides as much as I admire the work put into them. However, when a special game like Breath of the Wild comes along, admiringly defying all of the hand-holding norms of the industry — the tedious tutorials, endless hints and loquacious sidekicks (yes you, Fi) — and offers such a diverse and truly unforgiving world for players to get lost in, we have a rare example of a modern game where outside help is actually welcomed, and the idea of having a physical guide at hand finally feels justified once again. the idea of having a physical guide at hand finally feels justified once again. I can honestly say that The Complete Official Guide enhanced my enjoyment of an already sublime game, and it’s been a blast flicking through while playing. Heck, I found myself reading it even when I wasn’t playing, relishing in my studies for new strategies on the go in anticipation for my next play session. With extras included, an earnest respect for the player’s experience with its concealed spoilers and a beautiful cover fit for collectors, I am convinced Nintendo made a great decision in partnering with Piggyback. The standard edition and Collector’s Edition of these guides are available now, or if you’d like to go a step above, the Deluxe Edition will soon release on April 11. It’s worth noting that this upcoming third edition includes exclusives such as a premium hardcover, two ribbon bookmarks, and a 16-page retrospective celebrating thirty years of Zelda games. Whichever version you go for, The Complete Official Guide is a worthy companion in your adventure across Hyrule.